Nestled within the lively city of Rotterdam in the Netherlands, Dr. Susanne Meeuwis-Cools enjoys a successful dentistry practice. As an in-demand dentist with more than 34 years of experience, she understands what it takes to be a good medical professional. Because of her expertise, she had high hopes that carpal tunnel surgery to treat debilitating pain, numbness and tingling in her right wrist would allow her to return back to her bustling practice pain-free. Unfortunately, the type of surgery she had – known as open carpal tunnel surgery – required a six-week recovery with an additional six months of therapy. It also resulted in an incision several inches long. To make matters worse, just as she was slowly healing from her right-wrist surgery, carpal tunnel symptoms flared in her left wrist. That renowned and expert surgeon she found was Dr. Tyson Cobb of Orthopaedic Specialists in Davenport, Iowa. Dr. Cobb has perfected an advanced micro-invasive carpal tunnel release procedure that is far superior to open surgery. He has performed more than 5,000 micro-invasive carpal tunnel procedures, and he has covered the globe training other surgeons on minimally invasive surgical techniques. Susanne traveled from the Netherlands to undergo micro-invasive carpal tunnel release procedure performed by Dr. Cobb of Orthopaedic Specialists. In October 2018, Susanne traveled more than 4,000 miles and 16 hours to undergo a micro-invasive carpal tunnel release procedure performed by Dr. Cobb. Dr. Cobb’s method to help patients with carpal tunnel is dramatically less invasive than open carpal tunnel surgery. His innovative approach utilizes a state-of-the-art surgical micro-knife that can be used to perform carpal tunnel release with minimal trauma and scarring. Incisions that are smaller than the head of a pencil eraser are made, and the micro-knife is inserted through this tiny opening. Ultrasound technology is used to visualize the treated area and guide the instrument into place without causing damage to surrounding nerves, blood vessels, tendons and other sensitive tissues. Susanne’s surgery on her left wrist with Dr. Cobb could not have been more different from the surgery she had received on her right wrist. 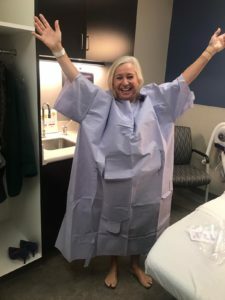 The operation performed by Dr. Cobb was on a Monday, and she was back to work one week later – a drastic difference from her extended time off work following her previous open carpal tunnel surgery. She also felt that the communication and care she received was second to none. 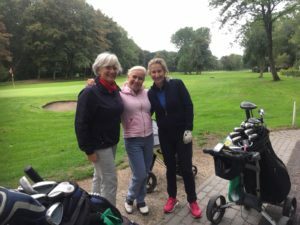 Thanks to micro-invasive carpal tunnel surgery performed by Dr. Cobb, Susanne (pictured in the middle) can golf again without pain. In addition, Susanne can do things she couldn’t do before. She is even back to golfing after not being able to hold the club for three years. She went skiing with her daughter in Austria and had no problem at all. She also is able to sail in the Mediterranean Sea – something that is incredibly important to her as only her and her husband handle their sail boat. “If I had known how much better micro-invasive carpal tunnel surgery is compared to open carpal tunnel surgery, I would have gone to Davenport to have both wrists done by Dr. Cobb at the same time,” Susanne said. Learn from Susanne’s experience. Research your options before undergoing surgery, and don’t forget about the world-class surgeons here in the Quad Cities. To learn about the best treatment options for your needs, contact us to schedule a free screening with Dr. Cobb. After a micro-invasive carpal tunnel release procedure performed by Dr. Cobb, Susanne is back to her normal life without the pain in her wrist.